2013-’14 Linchpin: G Russell Westbrook. It is remarkable when you average 23.2 points, 7.4 assists and 5.2 rebounds per game and are the second-best player on your own team. Westbrook has dutifully embraced his status as the Robin to Kevin Durant’s Batman, and last season he showed an immense growth in maturity, becoming a well-rounded and, more importantly, a more efficient scorer in the absence of James Harden. Westbrook’s knee injury, sustained against Harden’s Houston Rockets in the first round of the playoffs last season, all but doomed the Thunder’s title chances. So it goes with Oklahoma City, which needs Westbrook to return fully healthy and capable of his All-Star exploits on both ends of the floor if it expects to make a deep playoff run. He might consider taking a page out of Derrick Rose’s book and not return until he is fully healthy, which would benefit him in the long-term and might not harm the Thunder in the short-term as much as some think. Whether that means sitting out the majority of the season, however, remains to be seen, and in all likelihood, he will be back by mid-December. Westbrook’s erratic tendencies leveled off to some extent last year, but there is no telling whether or not they are gone for good. Improved 3-point shooting would hugely aid the Thunder’s offensive attack, but there is no counting on that either. Westbrook is the conductor of a sleek but careening train, and his driving ability allows for Durant’s catch-and-shoot prowess. A misplaced pass or ill-timed shot selection, however, is not out of the question for Westbrook, and he will need to continue to improve his court vision if the Thunder expects to return to the Finals. Overall: Let’s take a moment to remember that this is a team which had three of the league’s current ten best players on its roster only two seasons ago. Oklahoma City fans will lament the James Harden trade for years to come, and especially this season after his serviceable replacement, Kevin Martin, has departed for the Minnesota Timberwolves. Thabo Sefolosha will be the starting shooting guard this season, but he is on an expiring contract and could become a trade piece if certain possibilities open. Otherwise, he will see out the year and then seek out more money elsewhere, which should not be difficult to attain given the league’s understandable love of the lockdown perimeter defender. He is not the consistent third scoring threat the Thunder so desire, and neither is anyone else on the roster. Kevin Durant, of course, narrowly missed out on a fourth consecutive scoring title, and is coming into the season angry about being second-best. In other words, his eyes are full of hate. Almost without question, Durant is going to channel his anger into one of the finest basketball seasons in recent memory. He is the only person in the NBA who can go shot-for-shot with LeBron James on any given night and under any circumstances, and with LeBron’s two titles in the bag, Durant is the one playing with a more intense fire. His 50-40-90 performance last year only hinted at his true capabilities. He can shoot comfortably from anywhere on the floor. 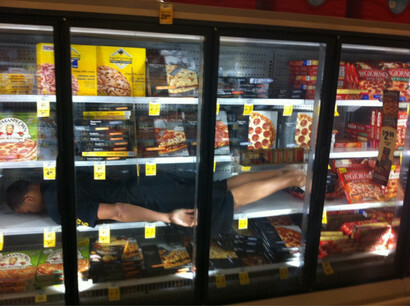 He does not care about pressure. He just wants to win. 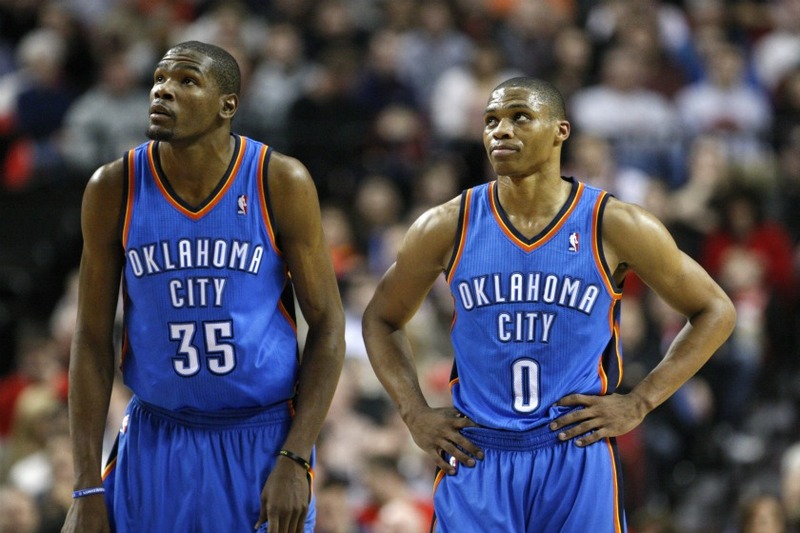 If Westbrook can return fully healthy, this team has a chance to do just that. A team does not win with only two players, of course. Sefolosha’s defense will be key, and his corner 3-point shooting should create some spacing on the perimeter on offense. Kendrick Perkins is generally worthless as a scoring “threat,” but he does bring championship experience, his rim protection is still quite good, and besides that he is just an extraordinarily intimidating human being whose smile is even pretty frightening. Perkins plays with tremendous anger and fierce loyalty, neither of which is surprising given that he is a devout and practicing Roman Catholic. Nick Collison is usually good for near-double-double numbers, and his rebounding will prove to be valuable on both ends of the floor. Derek Fisher is not the 0.4 seconds remaining threat he once was, and his contributions on the basketball court will be minimal. His knowledge of the game, of opposing defenses and other players will absolutely help in preparation. The jury is still out on Jeremy Lamb, who has the talent to grow into a very good basketball player but whose rookie season was entirely unremarkable, spending several stints with the Tulsa 66ers. The curious case of Serge Ibaka is what will propel Thunder-based discussions this season. His presence is what acted as the catalyst for the Harden trade, with Sam Presti believing that two scoring wings and an interior defender was a better combination than three scoring wings. Though he has become the best shot-blocker in the league and one of its best all-around defenders, Ibaka must continue to improve his offensive game. He had a career-high 13.2 points per game with an impressive 57.3% field goal percentage, which dropped over 10 points in the postseason. He cannot crumble under pressure again, and none of the main three players in this unit can get injured (further, in Westbrook’s case). The Oklahoma City Thunder are a championship threat as long as Durant and Westbrook are in town, but those will need well-timed assistance if they want to bring glory to the Sooner State. 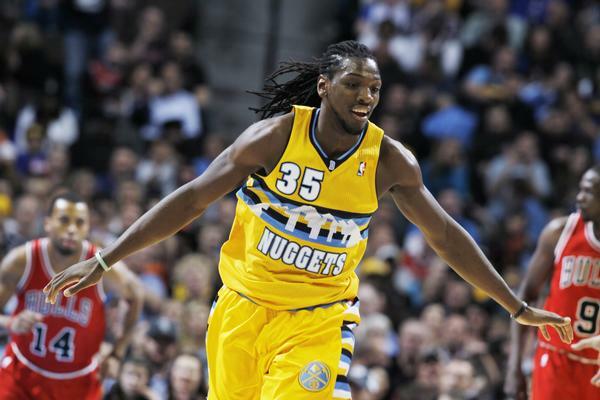 2013-’14 Linchpin: F Kenneth Faried. A walking double-double machine, Faried is one of the most explosive young players in the league, and this could be his real breakout season. He finished his college career as the all-time leading rebounder in NCAA Division I history, yet through two seasons he has failed to hit double-digit rebounding. This is the year he changes that. 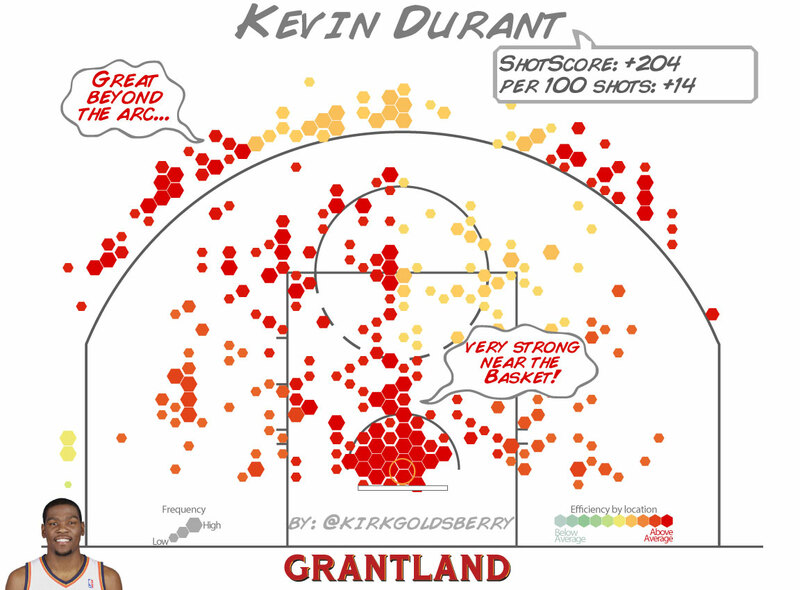 His consistent scoring ability is nice, but it is in offensive rebounding and his defense where he leaves his mark. Faried plays with a fearless, freewheeling style, and his all-around production should increase now that Nenê has gone to Washington. He will clog the lane and allow for Ty Lawson and the newly-arrived Randy Foye to engineer dazzling displays of dribble-pass-and-shoot. Faried’s inside game will also assist Nate Robinson, who goes through patches of streakiness which can benefit from Faried’s rim protection. This will be Faried’s first All-Star season, assuming he stays healthy. Overall: The Nuggets were one of the more fun teams to watch a season ago, and even with the loss of Andre Iguodala, that should not change. The addition of Randy Foye, who will provide outside scoring ability, should create some space in the paint and in longer two-point situations off the dribble. Nate Robinson had an incredible 2013 playoffs, providing the necessary spark in a D-Rose-less Bulls lineup. His game is one of the more pickup-friendly in the league, and his stature (5-foot-9-inches) makes him the poster child of smaller NBA players. Robinson is the perennial underdog, which works perfectly for this year’s Denver Nuggets. The Nuggets are contenders and have all the ability to beat any team if all the pieces fall into place. They have one of the most well-rounded lineups in the NBA. J.J. Hickson, coming off a double-double season with the Trail Blazers, will see solid minutes, and the team’s leading scorer and assist man, Lawson, should be able to continue to implement his crafty play to the Nuggets’ benefit. Class clown JaVale McGee is an anomaly, and he will need his rebounding to return to a circa-Wizards level in order to “rise in stature.” His reportedly 7-foot-6.5-inch wingspan will ensure at least a few blocking opportunities per game, and those limbs certainly won’t hurt in rim protection or ball disruption either. It does seem that he is much more comfortable in Denver than he ever was in Washington, and a happy JaVale has to be better than an angry JaVale. Danilo Gallinari’s injury will keep him out until the new year at the very least, but his return will represent an uptick in scoring for a team which had the best offense in the league in points per game last season. In any case, these are not the league laughingstock Denver Nuggets of the late 90s and early 2000s. If they can improve their supremely pedestrian defense even marginally, the Nuggets pose a serious threat in the Western Conference. 2013-’14 Linchpin: HEALTH. 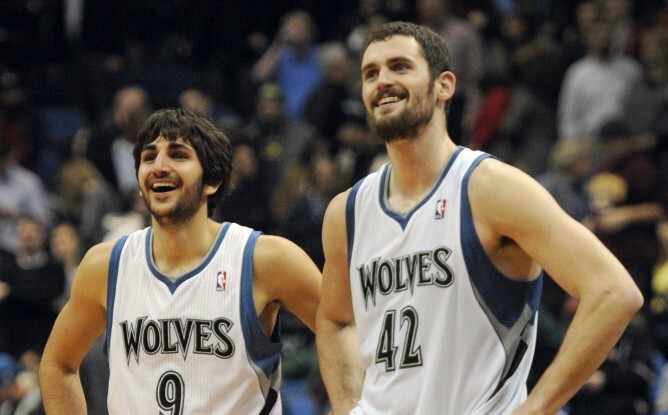 Kevin Love and Ricky Rubio have played so few games together that we have yet to see exactly what they can do. I was honestly surprised that a picture of them both in full uniform together existed, even in the expansive world of the Internet. Love missed all but 18 games last year with hand injuries, and Rubio was coming off a torn ACL from the season before that. Those two are the key to the Timberwolves’ success, and with nine straight seasons of no playoffs, Wolves fans are undoubtedly getting antsy to see the young core perform together for an extended period of time. Overall: On paper, this team is as good as any in the league. Period. It has all of the pieces, from a brilliantly creative starting lineup to an excellent bench, to win an NBA championship if any of the major contenders falter. The additions of Kevin Martin and Ronny Turiaf add padding on offense and defense, respectively, and Corey Brewer is a perfectly serviceable wingman who can provide valuable minutes with a nice scoring touch, as he proved in Denver. Nikola Peković is a tremendously gifted scoring talent who also rebounds at a high level, and Love’s return will divert attention away from Peković and allow him to play more freely. Derrick Williams should see continued improvement into his third season, building upon the 12-and-5 averages he managed last season. Paper is so fragile, however, and so is this team. There is no telling how Shabazz Muhummad will fit in with this lineup, and Luke Ridnour’s departure leaves a gaping hole in the ball handling area when Rubio isn’t in the lineup. The team chemistry is through the roof of the Target Center for now, and excitement for this season should be at a level not seen since the Garnett era. Kevin Love is a double-double machine whose good vibrations will send fans into a frenzy, and Rubio is a dexterous wizard who can thread passes through the legs of any defender. This is a one-two punch which can rival the Heats and Spurs of the world, if only they and their supporting cast can remain healthy and happy. 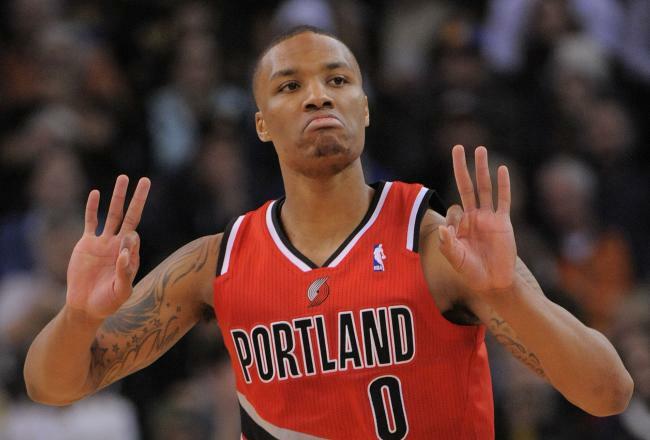 2013-’14 Linchpin: G Damian Lillard. Coming off a season in which he was only the fourth unanimous Rookie of the Year selection, Lillard was named co-team captain of the Trail Blazers and is expected to reach incredible heights in his second year. He averaged a cool 19 points and 6.5 assists per game, leading the team in the latter. He played all 82 games last year, a sign of increasingly rare durability for a rookie, and broke the record for three-pointers made in a rookie season (he finished with 185). Lillard is the clock by which the rest of his team, including LaMarcus Aldridge, must set its watch. He is a bright young star already, and with a contract through the 2016 season, Lillard is set to be the face of the Blazers franchise for some time. As he goes, so go the Portland Trail Blazers. Overall: Lillard and Aldridge are a stellar inside-outside combination on offense. Aldridge is a fantastic rebounder on both ends of the floor, and his play off the glass will dictate a lot of what Portland is able to do in terms of maintaining possession and milking the most out of its time on the ball. He and J.J. Hickson were seemingly the only ones carrying their weight, however, on a team which finished 24th in the league in rebounding a season ago. Enter Robin Lopez. While not an elite rebounder by any means, Lopez’s presence in the paint should create more opportunities for extended play off of missed shots. An improvement on defense is in order as well, and there is no telling from whom that will come. Mo Williams should provide some support in assists and steals at the point guard position in Lillard’s bench time, and it will be intriguing to see how Terry Stotts chooses to utilize C.J. McCollum in his first season after having so wonderfully managed Lillard’s transition to the NBA. This is one of the league’s youngest teams, and it could be poised for a surprise playoff run if all cylinders click. One or two more years of development will not hurt though, and the young core is on long enough contracts that it can grow together and return Portland to relative prominence in the NBA. 2013-’14 Linchpin: F/C Derrick Favors. With the loss of Al “Big Money” Jefferson to the Charlotte Horncats, Favors becomes the most visible player in Utah. He is the only player who led the team in any statistical category who will be returning this season, and he did it in blocks. The leading scorer and rebounder (Jefferson), leading assist man (Williams) and leading thief (Millsap) are all gone, leaving Favors to his devices. Now entering his fourth season in the NBA, Favors has a chance to vault himself to All-Star level productivity with a new-found abundance of minutes. Each of his offensive statistics should see an improvement this year, and his paint play will draw attention away from the perimeter, which is where Utah will have to live if it wants to have any scoring identity from outside of ten feet from the basket. 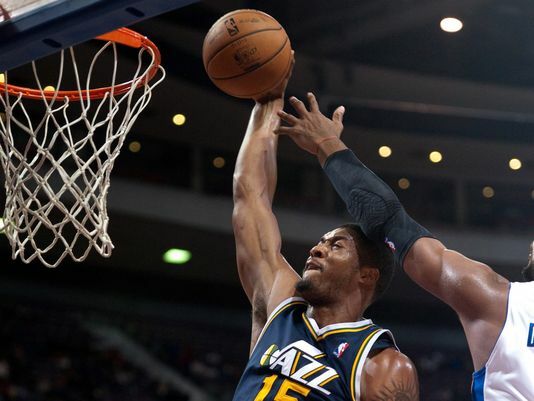 Overall: The Jazz enters the season without three of its biggest pieces from a 43-win season. Fans cannot and should not expect much music in the EnergySolutions Arena this season, without any real proven scoring threat to replace Jefferson or Millsap. Although Rudy Gobert has had a very productive preseason with a couple of monstrous games, he will be competing for minutes with Favors and Enes Kanter, who immediately becomes the most efficient option in terms of field-goal percentage, an area in which the Jazz struggled mightily last year. Brandon Rush should be a nice addition, particularly if he can return to 2011 form or even better than that with more minutes. Andris Biedriņš once averaged a double-double in points and rebounds in a season for Golden State, and at only 27, it is not unfathomable to see him do it again given the opportunity. Trey Burke has an incredible amount of potential to be an electrifying backcourt presence in this league, and his confidence will be high coming off one of the most heralded two-year collegiate careers of the last decade. All told, however, it does not seem that the Jazz are equipped for the present, and a lottery pick is likely in Utah’s immediate future.